A healthier Indonesia: Up in smoke? It’s a pleasure to meet people who are happy with their work. I met one such on Sunday. “Praise God, I can’t complain. I’ve been in this business for 47 years, and it’s allowed me to put four children through college.” So said the gentlemen in the photo; his business is selling tobacco in the markets of South Sulawesi. 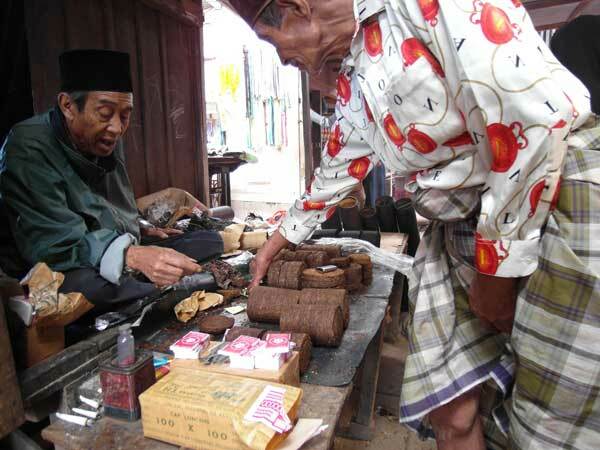 He offers me a great slice of rolled tobacco “enough for a week” for 8,500 rupiah, just less than a dollar. I make a crack about my body being under enough strain without the help of tobacco. He smiles and waves a hand. “Luckily, nobody here believes that stuff about tobacco being bad for you.” The buyer, who chose a lower-grade slice that cost him just 3,500 rupiah, was indignant. “On the contrary. Smoking is what keeps me strong”. You can dismiss this as the talk of country folk (we were in the vegetable growing hill town of Malino). But in distant Jakarta, the government appears to be chickening out yet again from imposing long-promised smoking reduction measures. Around two thirds of Indonesian men over 15 smoke, according to WHO estimates for 2008 (pdf), compared with just over a quarter in Australia and a third in the UK. Indonesia has the distinction of being the only country in Asia not to have ratified the United Nations Framework Convention on Tobacco Control. It’s impossible not to see this as the result of effective lobbying on the part of Indonesia’s huge tobacco industry. Tobacco brought in more than eight percent of all tax revenue in 2011, over six billion dollars. Although anti tobacco lobbyists pump out numbers that suggest that cutting smoking would increase health, productivity and income in the long run, the promise of savings in a decade can’t really compete with the heft of six billion dollars in the exchequer when elections are looming. So plans to put graphic warnings about the consequences of smoking on cigarette packs, to provide smoke-free workplaces, to restrict cigarette advertising in the media are very likely to go on the back burner yet again. Demonstrations by tobacco farmers and cigarette rollers (yes, a diminishing but still significant proportion of Indonesia’s clove cigarettes are still rolled by hand) will turn down the heat on even the smallest burner. But Big Tobacco is not taking it easy. Philip Morris-owned Sampoerna leads the field in sponsoring an Indonesian arts and music scene that would otherwise be almost totally neglected. It’s almost enough to make one smoke. 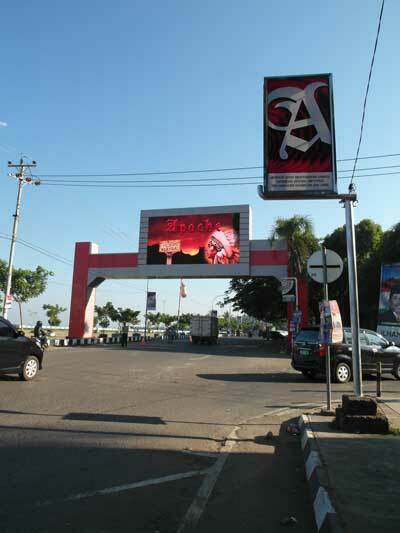 And in Eastern Indonesia’s biggest city of Makassar, just down the hill from Malino, cigarette firms have sponsored two vast digital screens that bridge the main road along the waterfront and run cigarette ads on a continuous, driver-distracting loop. The tobacco companies are smart to cover their bases, but they probably don’t need to worry too much. Politicians need them. Over 70 political parties are registered with the ministry of justice; many are already fretting about how to fund their campaigns for the 2014 presidential election. And the cigarette companies are usually happy to oblige. There’s a lovely circularity to their generosity. Much of the cash that they slop in to campaigns will trickle into the hands of the poorer voters. And what do poorer voters do with unexpected disposable income? Buy cigarettes. Round and round. Same as it ever was . . .
And aren’t you due back round here (London!) soon? Ah yes, tax revenue. One of my theories about the fundamental problem of the Indonesian state is that it cannot raise enough revenue to properly fund itself. This simple reality helps inform and explain such seemingly diverse ills such as the acceptance of tobacco, the free reign that TNI is given in revenue-raising operations and the need to clamp down and hold restive provinces in order to extract revenue from mineral wealth.